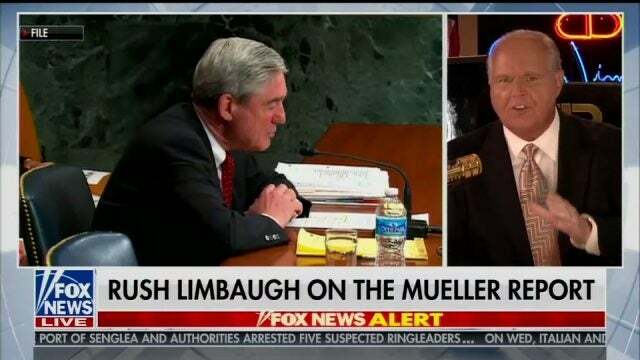 HANNITY: Joining us now live from EIB Southern Command headquarters, the most-listened to talk radio host in the history of the medium, radio talk show legend Rush Limbaugh. Hey, Rush, how are you? RUSH: I am fabulous. It’s great to be with you tonight. HANNITY: You know, for those that never got you, “with half my brain tied behind my back just to make it fair,” in a lot of ways you’re like Trump. You say these things and people bubble and fizz like Alka-Seltzer. They have no sense of humor. So you say controversial things also, and you’re joking when you say half my brain tied behind my back. RUSH: Well, no, actually I do. I split my skull open and I take it out and put half of it behind my back. It’s like when I say, “Talent on loan from God.” These people say, “He’s calling himself God! Can’t believe this.” Sean, I’ve been listening to your whole show. The people that we’re talking about tonight don’t have a sense of humor. To them, life is a war. Every day of their lives is a battle. We are the enemy. Their effort is to eliminate us. Al-Qaeda is not their enemy and ISIS is not their enemy and socialism’s not their enemy, communism. We are. Conservative and Republican America, in their view, are the obstacles in their way to their desire to create this totalitarian state that they think is gonna end up being a utopia. And I was listening to you and Don Jr. talking about this should never ever happen again. I have to clarify. It is not over! It is still happening. The Democrat Party and the media and all of these people from the Obama administration who ran this scandal are still running it. The objective remains to get Donald Trump out of office either by driving his numbers down or impeaching him or defeating him in 2020. Today the New York Times has this story that the Mueller report is 300 pages and the Barr summary is four pages. Therefore, Barr is lying. Pelosi literally said that we cannot trust the attorney general. So what we’re being led to believe by these people — remember, they have to feed their beast with this fake news constantly. They have created a monster that believes and absorbs and needs fake news like vampires need your blood. And these people are believing now that there is evidence of collusion in the Mueller report and that Barr is not telling the truth! And the New York Times is leading this effort. The rest of the Drive-By Media is gonna pick it up because it prolongs the narrative that Trump is unworthy, that Trump cheated, that we need to redo the election results of 2016. So we’re being led to believe that this report does contain evidence of collusion. Barr’s lying about it. Now, this is so silly. If it contains evidence of collusion then where is Mueller on television every night saying, “Wait a minute, wait a minute, that’s not what my report says. My report has plenty of evidence of collusion. I have all these anti-Hillary people on my staff and we found all kinds of evidence and Barr is lying.” Why isn’t Mueller doing that if Barr is lying in the report? Two years, every day on my program, 15 hours a week, I pummel people with this. And then it turns out to be not true, I’m finished. I can’t face my audience again. I’ve lied to them. They wouldn’t want anything to do with me. I would try to apologize, but I wouldn’t get away with it because I would have exploited them, I would have used them, I would have toyed with them, I would have manipulated, I would have lied to ’em. This exact thing has happened from MSNBC, to CNN, to the New York Times, to the Washington Post. They’re lying to everybody, and their audiences don’t seem to care! “Just give us more fake news!” They want it. They can’t accept that it’s not true. They can’t accept that Donald Trump is not a traitor. They’re not happy to learn that their president is not a foreign agent. They’re unhappy. We’re dealing with deranged people who are not rational. We can’t deal with them rationally. Karl Rove today said, “Mr. President, you need to move on. You don’t need to do an investigation. You don’t need to find out what happened. Swing voters don’t care.” One thing that I heard that you guys were discussing that I completely agree with, we have got to get to the bottom of this. We’ve got to have people named. They have to be held accountable. If jail time is called for, they need to go to jail. They knowingly lied to the American people. The media were willingly complicit in this. They were not fooled. They wanted it all to be true. They ran a scam. They ran an effort to try to get Donald Trump thrown out of office. Normally they’re able to get rid of Republican presidents whenever they want to. But they failed with Trump. So now they’re doing a new tack: “The Mueller report must contain some evidence. Why, it’s 300 pages.” They’re not going to give this up. And this is why there needs to be, I don’t know if it’s a special counsel, I don’t know if it’s literally charging people, but we need to get to the bottom of this and find out just how high up the Obama totem poll this goes. And I think it goes all the way up to Obama. I don’t know how he didn’t know about this. Brennan, Clapper, all of these people in his regime, leadership and the FBI, it’s not enough to call it the worst scandal in the world. They almost got away with this, Sean. And the fact that we say it can never be allowed to happen again, it’s still happening. They haven’t changed their tack whatsoever. The objective remains, get rid of Trump, defeat us however they can. HANNITY: — an attempted coup. 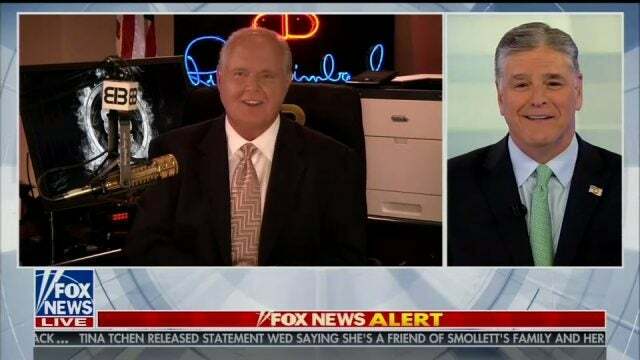 RUSH: It is totally scary. I don’t think the American people understand. This was not — ladies and gentlemen, don’t doubt me here — it was not an investigation. There was never any evidence of collusion. Robert Mueller took this gig and opened his investigation without evidence. There was no evidence. He wasn’t even given a specific crime to pursue. It was open-ended. It was go find a crime because there weren’t any crimes that had been committed. But what we just went through was not an investigation. Robert Mueller has known for a minimum, folks, of 18 months that there was no collusion. Why did he not shut it down 18 months ago? Why did he take the gig? He took the job knowing there was no collusion. The only collusion — we’ve been saying it ad infinitum — is Hillary Clinton with the Russians and Steele creating this dossier, and they try to pass this off as legitimate intel. You talked about Brennan earlier. He met with the House Democrats yesterday. This isn’t over as far as they’re concerned. And Brennan is the guy who passed the dossier to Harry Reid. Everybody thinks it was McCain, and McCain played a role in this. But this was not an investigation. This was a coup. This was an attempt to find a crime. And the fact that they couldn’t with all of this money and 19 people on his investigative team, at least the lawyers who were from the anti-Trump camp, the donors to Hillary Clinton, and they couldn’t find anything. Sean, ladies and gentlemen, you have to know the passage in the Mueller report where it says: “numerous entreaties were made by Russians to the Trump campaign, but the Trump campaign –” that’s not what happened. What happened is the FBI attempted to plant their own informers in the Trump campaign, one of them named Stefan Halper, a Cambridge professor, MI6, U.K., they tried to get him hired in the foreign policy advisory role here during the campaign, and fortunately whoever interviewed him didn’t hire him. If he had been hired and they tried to get two other people, if they had been hired, guess what they would have done? They would have started communicating with Russian agents they know, and then there would have been the collusion that the FBI was trying to create. There wasn’t any. This is worse than anybody is being led to believe it is, because it’s being called an investigation and Trump passed the test, they didn’t find anything. They’re not finished. They aren’t through trying to get rid of Donald Trump. They’re not through trying to overturn the election results of 2016. They’re never going to finish trying to get rid of Trump. Even if he’s elected in 2020, they’re setting up the impeachment now with all of this stuff. That’s why these people need to be politically defeated and pounded into the ground to the point of irrelevance. And the way to do it is to educate as many Americans as possible to what happened. And you can’t do that by moving on and saying, “Okay, well, we escaped this one, gang, let’s move on to the next agenda item here,” which better be immigration, by the way. It is not finished, and it wasn’t an investigation. There was no evidence ever of collusion. It should never have begun. Rosenstein should have never appointed anybody. The FISA warrants to spy on the Trump campaign were illegal. The judges there were either complicit to this or they were lied to and now don’t care. We’ve got a two-tier justice system. The very foundations of this country have been attacked and assaulted and the people who know it in the mainstream media are complicit in it instead of trying to blow it up and explain it to the American people. We’re in a very, very dangerous point in the history of our nation, and there’s just one guy standing up against all of this, and that’s Trump. There’s not another Republican that I know of — maybe you do, Sean — there’s not another Republican that could have withstood what Trump’s put up with for one week. They would have been suing for peace, they would have been giving up, they would have acknowledged all this and resigned. It is a stroke of luck here that we’ve had Trump to put up with this. But the fact that it was attempted by unelected — the counterintelligence apparatus of this country — CIA, DIA, NSA — was turned against one man and his family and by extension his supporters and his administration because he had the audacity to win and defeat Hillary Clinton. And these unelected people, these arrogant, elite, effete snobs in the so-called deep state, administrative state, simply couldn’t abide it and had not stopped. McCabe is still out selling his book on the basis that there’s collusion. And we see Pencil Neck out there claiming that there’s still collusion. And we got Swalwell. These guys, it ought to prove to everybody that it is an ongoing political project to get rid of Trump. They don’t care about whether or not the Russians actually spied or actually affected the election because they know it didn’t happen. And if somebody was given the order to rig a presidential election, I don’t even think it’s possible, and Obama even said so. So this whole premise is ridiculous, it’s not legitimate, and yet everybody’s dealing with this as though, “Wow, serious investigation, wow, did we dodge the bullet.” It’s not an investigation. This was an attempt to throw him out of office just because he won and they didn’t like it. It’s no more complicated than that. RUSH: No teleprompter here, Sean. No teleprompter. HANNITY: No, you did not. That’s all extemporaneous. HANNITY: You know, there are few of us here at Fox — prime time, Laura, Tucker, Fox & Friends. There is you, leading in talk radio. I’m on talk radio. Mark in talk radio. I’ve had an ensemble cast on this show that have dug deep. The 99.9% of media Drive-Bys bought it, sold it — hook, line, and sinker — and, as they always do, get it wrong. That’s never gonna change, is it? RUSH: They didn’t buy anything. They didn’t buy anything! They were in on it! They don’t feel any remorse. They’re unhappy they failed. They don’t care they lied to their audiences. They’re not worried that their audiences are gonna reject them. They’re not worried if their audiences now don’t trust them or believe them. They were in on it! They were complicit! They considered themselves to be part of this elite gang inside the Beltway that runs the town. And they were in on it. And so all it is now is that they have failed. You know, I saw something where MSNBC primetime had a sudden, inexplicable 20% loss in audience one night this week. What does that tell you? You’re a broadcast professional. I’m a naturally talented, highly trained broadcast specialist. 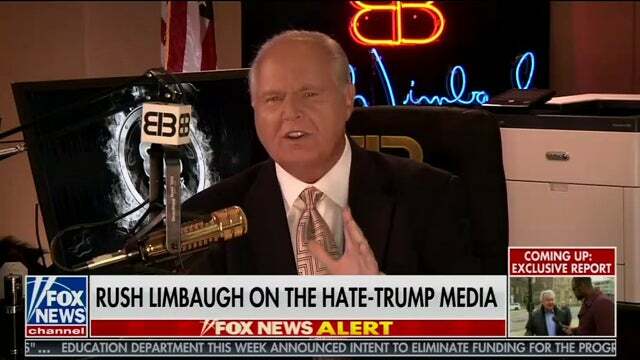 RUSH: Let me tell you something: When she loses, Rachel Maddow or CNN — when they lose 20% of their audience just because this thing bombed out — it tells me that their audience is there not because of those people, but because of the fake news. And when the fake news bombs out, when all these expectations that Trump is going to jail, Trump is going down. Well, he’s not; it didn’t happen. They failed, and so MSNBC cannot serve their expectations anymore, and their hosts are not enough to hold the audience. It’s nothing other than a testament to the fact that they create an audience that wants to believe a bunch of lies, wants to believe the worst about their country because they get up every day doing that already, and now what are they gonna do? That’s why these people have to come up with the new hook. “The Mueller report is 300 pages; Barr summary is four. There’s gotta be collusion there!” Now they’re trying to get everybody worked back up, lying to ’em again, continually lying to ’em, misrepresenting the truth, manipulating these people. It’s no wonder we can’t come together, Sean. Whoever it is that watches the Drive-By Media and prime time cable on the left, there’s no way we can ever have anything in common with ’em. They’re being told, they’re being instructed to literally hate this country because it’s unjust, it’s unfair, it was founded immorally or something. This is a dire circumstance when facts and truth don’t even have a chance with a certain segment of the population, when they have been trained and conditioned to want to believe the worst and want… You would think that they would be happy that the president didn’t collude, that the Russians didn’t determine the outcome of the election. But now look what they’ve even done to that. Every election going forward is tainted. “The Russians, did they…?” Every time the Democrats lose, it’s gonna be some external factor. It can’t be that they lost because they were rejected. Noooo! It’s gonna be the Russians or some other foreign agent got in there and cheated and stole it from whoever their next nominee is. It is… That’s why there shouldn’t be any attempt to cross the aisle, make common ground. We don’t have any common ground with them. They need to be pummeled into the political dirt and become acknowledged as the minority they are — and I’m dead serious about this. Dead serious about it. We’re in a crisis in this country because the media has given up even the pretense of objectivity. They are now leftist activists pushing an agenda — and this one failed, so it’s on to the next one. HANNITY: As I listen to you really closely, this is ongoing, but there’s another factor. Look to 2020, New Green Deal. What do you see on the horizon politically? RUSH: (laughing) The New Green…? RUSH: Wha…? (laughing) The New Green…? RUSH: (sigh) The New Green Deal. Can you prove this is happening? This is something that gets recycled. We don’t even have the power to impact the climate. We can’t change it for better or worse, but it is constantly changing. All we can doing is adapt to it. We’re the best in the world at that. Green New Deal? They can’t even support it in the Senate when it comes up for a vote, and it’s another lie. It’s another example of how they’re manipulating and misrepresenting their (sigh), unfortunately, sick base. The sick base wants to hear this. They want to hear that we’re gonna die. They want to hear apocalypse is coming. They want to hear that life is nothing but eternal suffering — and they want somebody to pay the price for it. If it’s the rich, if it’s billionaires, if it’s corporations, if it’s Republicans or whoever else. So these people are happy! They are happy to lie to their own voters and tell ’em, “Life ends in 12 years,” unless we do what? Retrofit every building? Stop cows from farting? Stop eating beef? It’s… It is insane! RUSH: And you can go through there… Yes, I know I’ve got diarrhea of the mouth, here, Sean. I’m sorry. HANNITY: No, no, no, no. I really have one more question. Can you stay…? I gotta charge confiscatory rates; they’re gonna kill me for not breaking. HANNITY: Can you stay for one more question? RUSH: Yeah, absolutely. I’ll be happy to. I’m gonna light a cigar and be here when you get back. HANNITY: All right. (laughing) I’m sure it’s American. Hang on right now. All right. Quick break. Important update when we get back. I have a really important question. Rush is on fire. He stays with us. We’ll continue. HANNITY: No, no. I’m serious. I’m being extraordinarily objective. 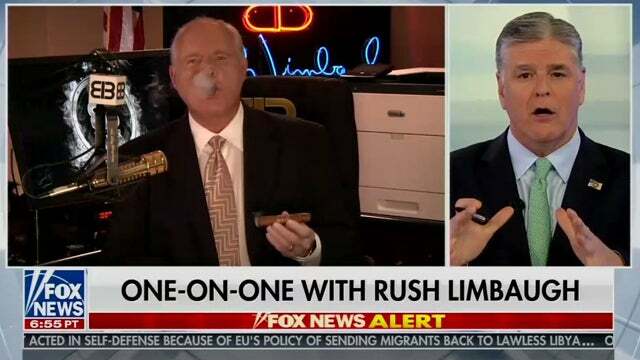 RUSH: Well, that’s what happens when you have a lot of time. So I appreciate that, Sean. You’re very, very generous. HANNITY: Listen, this is really important what I’m gonna ask you. You say we must defeat them. HANNITY: 2020’s around the corner. How? 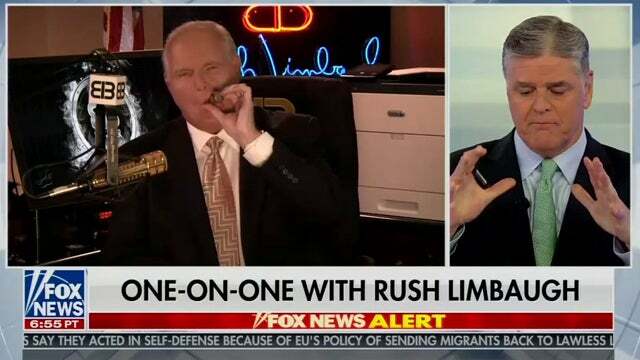 RUSH: Well, obviously defeating them requires the president being reelected, and I’m gonna tell you: In my estimation the one thing that he needs to zero in on is immigration. I know he wants the Republican Party to become known as “the party of health care,” because that… You know, that’s a tangible thing that really matters to every human being in this country. But I’m telling you: He was elected on immigration and stopping it. Sean, we suspended immigration to the United States from 1921, I think, through 1965 in order to assimilate all those who had come into the country legally from the late 1800s through 1920, Ellis Island and all that. We had to assimilate them. They had to become Americans. They had to join American society, American culture. That isn’t happening. We have a political party opening the border for illegal immigrants to come. What happened to the rule of law? I think the president should shut the border. If he shuts the border and builds the wall, there is nobody, Sean, that can beat him in 2020. It remains the issue for the vast majority of freedom-loving, Constitution-loving, American-loving citizens. If it doesn’t happen, the country that we know and love… There’s always gonna be an America, but it’s not gonna remain a constitutional republic as founded if we don’t get a handle on this. HANNITY: Let me go to the other issue, and that is the economy, foreign policy. You know, here’s the bigger question. Where is the backbone of other Republicans? I’m not a Republican… I’m not registered Republican, I’m a conservative, because I think they’re weak. Where is their backbone? 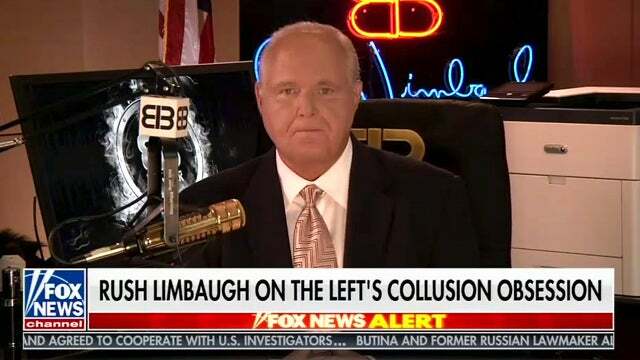 RUSH: Well, you know, we talk about this a lot every time we get together, and look… (sigh) The Republicans for the first nine months of Trump’s first year believed this scandal crap and they thought Trump was gone, and so they wouldn’t get behind the agenda. Half of them didn’t want him to win. Look at all the Republicans that resigned ostensibly because they were losing their committee chairmanships. But we wouldn’t have suffered this massive midterm loss if so many hadn’t resigned. The Republican Party is not unified. American conservatism is not unified. And so right now, Donald Trump remains the unifying figure, or at least the blunt-force figure that can… Look, everybody wants to be in the bright lights of winning, even these Republicans you’re talking about. They’ll be glad to show up when the fighting’s over and shake hands and put their hands in the air in the bright lights and act like they played a role in it. Maybe so. But waiting around for them to get on board is… I don’t think we have the luxury to do that. We have to bring them on board, like we have to bring the swing voters to our side. Not go defensive and try not to offend anybody and hope we show them we’re nice people. If we haven’t proven that we’re nice people after all of these years, it’s a lost cause. We have to engage in issues that matter most to the American people, are gonna improve their lives, gonna make them feel trust and hopeful about their country and their future. There are gobs of people that to want feel this way. There are gobs of people out there that want to be proud of this country. RUSH: And I’d just tap into it and make it happen. I see… Yep, yep, yep. There I go again. HANNITY: Listen, thank you. This is perhaps an epic monologue that will be looked at for years. We can’t thank you enough, Rush. Thank you very much.